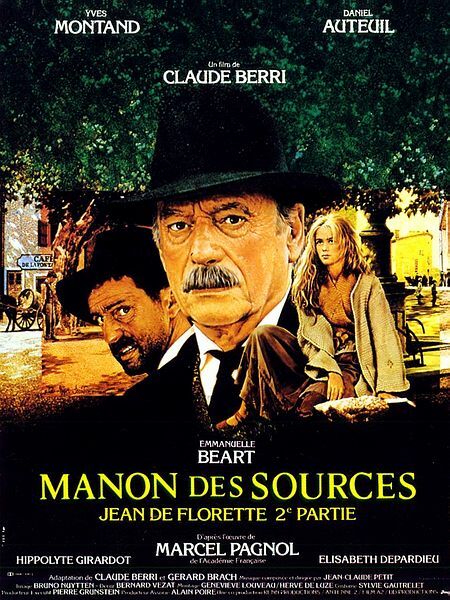 Well actually it is two films that are two parts of the same story: Manon des Sources and Jean De Florette. They are based on the two-part story book based on a film the author wrote of the same name – so it is a film, based on a book, based on a film! Who say’s the film is never as good as the book! Directed by Claude Berri based on the novels by Marcel Pagnol, starring Gérard Depardieu, Yves Montand, Daniel Auteuil & Emmanuelle Béart with a brilliant musical score by Jean-Claude Petit. Filmed in 1986 and set in rural Provence, France between WWI and WWII. The scenery is stunning, the music is so very beautiful and the story is a touching and emotional journey of human actions and their consequences based on the lives of two families, two farms and the neighbouring village in the same idyllic valley. I’m not going to tell you any more about the story because you really should watch the films and I would recommend you watch them in the original French and not dubbed, if you don’t understand French watch them with subtitles. At the time they were the most expensive French films ever made, were a great commercial and critical success, both domestically and internationally, and were nominated for ten César awards, and ten BAFTAs. Over the years they have both done much to promote the region of Provence and France as a tourist destination. This entry was posted in Blogs, Extra X-Wide P, Film, Tumblr and tagged 30 Days, Claude Berri, Daniel Auteuil, Emmanuelle Beart, film, France, Gérard Depardieu, Jean de Florette, Jean-Claude Petit, Manon de Source, Manon Des Sources, Marcel Pagnol, Provence, xwidep, Yves Montand. Bookmark the permalink.